NOCVA is a national non-profit 501(c)(3) advocacy organization based in the Nation’s capital that seeks to unite and organize Chamorro veterans and their supporters in the 50 states to leverage their collective political influence to work on behalf of all Chamorro veterans and their families – in the US, in Guam, and in the Northern Mariana Islands (CNMI). What does NOCVA do for Chamorro veterans? NOCVA was started by Chamorro veterans Cel Aguigui, Larry Cruz, and Frank Blas. Since the 1990s, various efforts were made to organize Chamorros from Guam and other Pacific Islanders, but they had limited results. 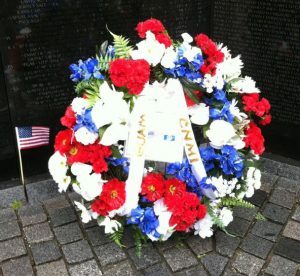 Finally, in August 2011, a meeting with Chamorro veterans in North Carolina led to a renewed effort to establish a grassroots advocacy organization that would enlist the help of Chamorro veterans living in the United States who were motivated to work together on behalf of the Chamorro people. Aren’t there similar advocacy groups from Guam that already exist – how is NOCVA different? NOCVA is the first national-level advocacy organization specifically established to unite and organize Chamorro veterans living in the 50 states. Unlike their Chamorro brothers and sisters in Guam and the Northern Mariana Islands, Chamorro veterans living in the states have voting rights and can leverage their political power to influence issues important to themselves and the Chamorro people. NOCVA operations are managed by founders Cel Aguigui and Larry Cruz from the Washington, DC, area, assisted by a National Staff. Frank Blas, a founder, also serves as a regional coordinator in North Carolina. Regional coordinators throughout the United States manage individual chapters. A special adviser based in Guam and a special adviser on Chamorro women veterans both serve as resources to the National Staff. Why Do We Need an Advocacy Group for Chamorros in the Nation’s Capital? Virtually all national and ethnic groups in America, such as the Chinese, the Japanese, the Filipino to name a few, have their own national advocacy organization (some have several) working hard on their behalf — that’s how things get done in our country. You need a strong clear voice to raise national attention for the issues you care about. Despite well-intentioned activities of various Chamorro clubs throughout the U.S. and in Guam, as well as efforts by passionate Chamorro rights activists and concerned citizens, there is no well-known and effective national organization to advocate for Chamorros. NOCVA seeks to fill that void. We want to provide a strong, clear, united voice for Chamorros on the issues they care about. We aim to be the leading advocacy organization for Chamorros in the nation’s capital and will develop strategies and opportunities that effectively promote, protect, and advance the interests of the Chamorro people. Chamorro Veterans: In the Territories or In the US Mainland—What’s the Difference and Does It Matter? Chamorro veterans have a long, proud tradition of military service to the United States. They have fought with honor, spent entire careers marked with distinguished service; many have given their lives for this country. Yet, though they share a common Chamorro ancestry, veterans from Guam and the Commonwealth of the Northern Mariana Islands do not enjoy the same rights as their Chamorro brothers and sisters living in the U.S. mainland. * Despite repeated efforts to change their political status, veterans living in the US territories are denied the same rights as other Americans or even the rights of people in other countries whose right to democracy they may have fought to preserve. Without representation, these veterans are forced to sit on the sidelines, unable to vote in national elections or to access representatives in Congress who can influence legislation to their benefit. To add to this problem, Chamorro veterans who do live in the U.S., who could make a difference by virtue of their different political status, may suffer the same fate because they do not take advantage of their potential power as citizens of the U.S. The veterans in the states may share the same lack of political power as their non-voting counterparts in the territories. Their contributions are often unnoticed and unrecognized. Why a Chamorro Veterans Group? Every day in Washington and around the country, veterans groups are working to build coalitions and networks to build clout. By organizing and uniting around a shared purpose, they can maximize their power and influence. National organizations, especially the Department of Veterans Affairs, routinely reach out to these minority groups to ensure that they receive the benefits and service due to them. Through NOCVA, we can now take a seat at the table during these national-level meetings to speak up for the rights of Chamorro veterans. We no longer need to take a backseat and let other groups represent us, giving away our chance to represent ourselves and fight for our needs. How Can Chamorro Veterans in the US Mainland Make a Difference? Chamorro veterans living in the mainland are the key to this strategy. Because of their unique status as U.S. citizens residing in the 50 states, they have political power and can leverage political influence. Further, Chamorro veterans share a common background, similar experiences, and a strong solidarity with each other. They have demonstrated an ability to work together to get things done. Sharing a common Chamorro ancestry, they speak the same language and understand the challenges and issues facing not only themselves but also the Chamorro people in the mainland and in the territories. Working together – by reaching out and organizing the Chamorro veterans living in the mainland, by uniting our voices to raise awareness about our needs and those of the Chamorro people — we can build an effective advocacy organization that can leverage the political power we have as U.S. citizens. Ultimately, we can work to influence Congressional legislation to benefit all Chamorro people, whether they live in the territories or in the 50 states. The stakes are high and we need to act now. We need your support; working together we can make a difference. *Guam is an organized, unincorporated territory of the US with policy relations between Guam and the US under the jurisdiction of the Office of Insular Affairs, US Department of the Interior. Northern Mariana Islands is a commonwealth in political union with the US; federal funds to the Commonwealth administered by the US Department of the Interior, Office of Insular Affairs.